Count Fang's Castle is the last level of World 2 found in Yoshi's New Island. 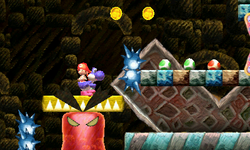 Yoshi starts the level in a castle with some moving platforms and enemies nearby, along with some spiky hammers that can be lifted when tossing an egg at the platform near them. Soon, Yoshi comes upon a pipe which leads him underground to an area where he has to use a Blarggwich to lead him back inside the castle where a Checkpoint Ring awaits. Here, the Yoshi must use moving Blarggwiches to transport him to the boss door where Count Fang awaits. He must be hit three times in order for the player to access the next level. This page was last edited on April 12, 2019, at 12:49.